How about the tea cup above? She is sweetly romantic with her bounty of flowers. 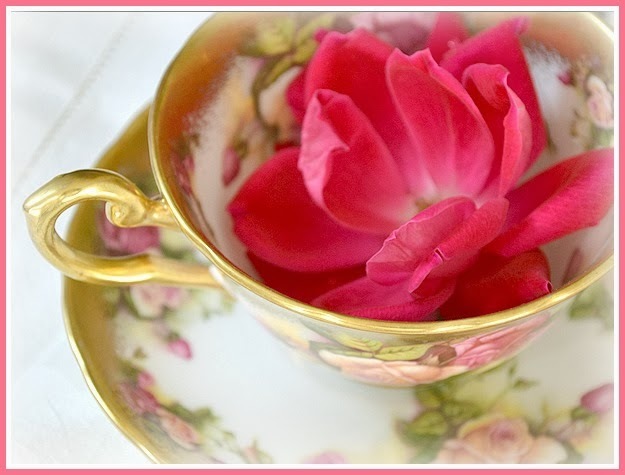 A rose adds to this cute tea cups romantic charm. She too is a sweetly romantic cup. Have an idea of this cups creator? I know it's name, but not anything about it. 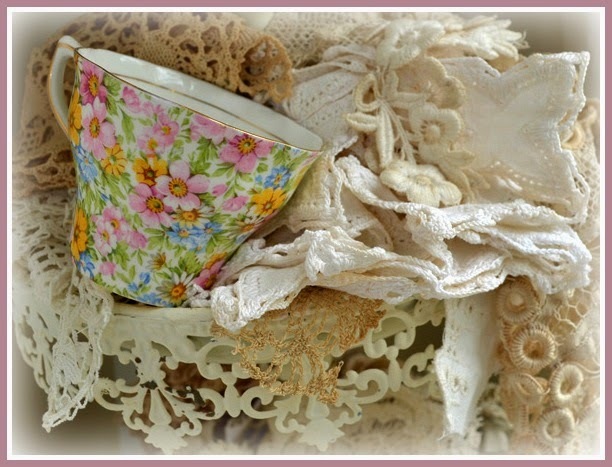 Put lace near any tea cup and it looks romantic! lol! Hint: This is one of my all time favorite china companies. Lovely gold filigree always looks romantic to me. Not sweetly Romantic, but more classy. Do you recognize this cups maker? This style really lays on the layers. Guessing her maker may be a real challenge. 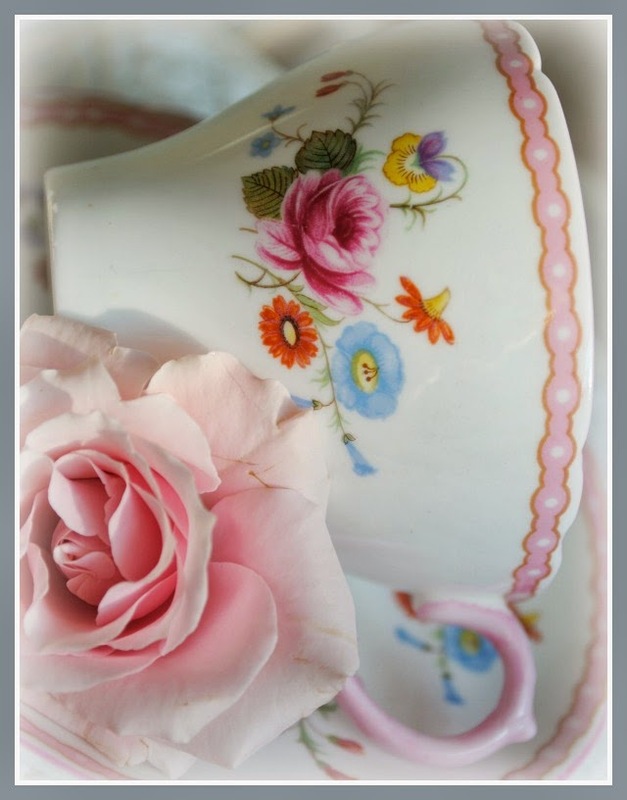 Old Country Roses must get many votes for most romantic china pattern. It's traditional beauty really steals the show! Many of you can guess this beauties manufacturer. I feel this is the most romantic tea cup I own. Maybe it is the bohemian feel? Maybe it has seen many travels? Maybe it was owned by a woman in LOVE? Most Romantic Cup this Valentine's Day. Want to join in the tea cup fun? Wow - it's hard to pick which I like best. Even my husband who was standing here was quite impressed! Beautiful! I love your guessing game about who made the different cups and saucers! I think you should do this more often for it was so much fun. I knew the Shelley for it is so identifiable. Thanks for hosting this great party. Hope you have a lovely 14th! Oh wow Terri these are so gorgeous with all the pink roses and especially the gold filigree. I love those two especially! I can't imagine how many beautiful cups you have in your home!!!!! That was fun! The only I got right was the Royal Albert. Roses and flowers for Valentine's Day ... some bling and lace - perfect! Happy Tea Day! They are all lovely Terri! I agree that Old Country Roses is the most romantic...beautiful pattern. Sending love back to you. Wow Terri! You have the most beautiful collection of teacups I've ever seen. I knew the Shelley and they seem to be my favorite. The Bohemian style does have a very romantic feel to it and it is lovely. Beautiful display of romantic teacups, Terri. It's difficult to choose a favourite and I enjoyed your guessing game. Thanks for sharing and Happy Valentine's Day! Beautiful all of them, I am NOT going to pick any...so gorgeous! Thank you for the lovely tea party. Enjoy your week. 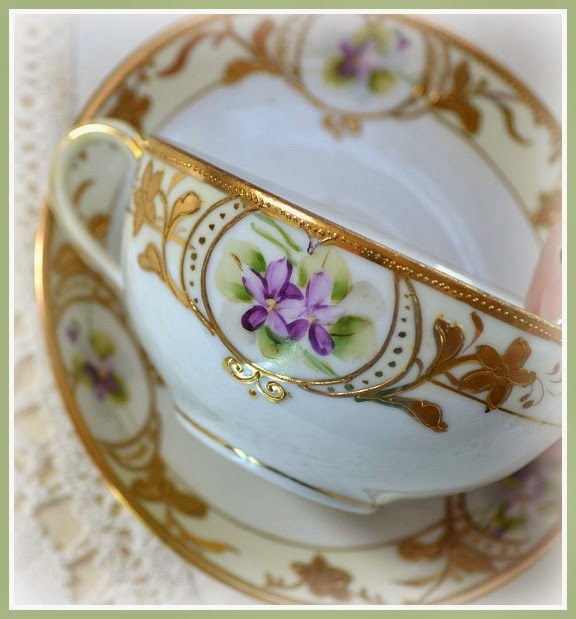 Pretty floral teacups, makes me long for spring when all the flowers start to bloom. My very favorite is cup #6, but #1 is a close second. I like #4 as well. 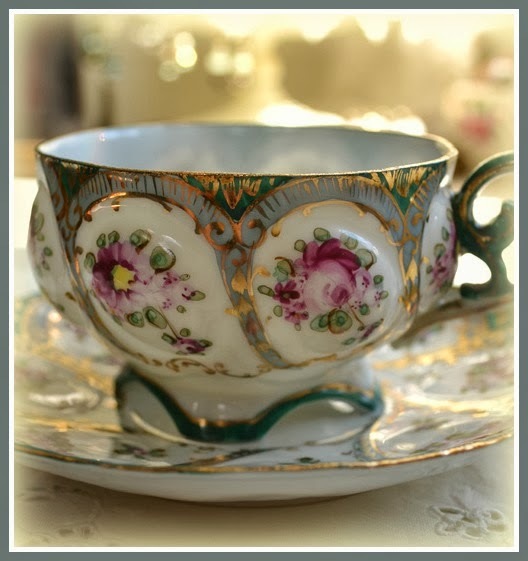 Beautiful teacups, Terri! Happy Valentine's Day! Hi Terri. Beautiful! Hard to choose which to have for tea. Happy Valentine's Day and thanks for hosting! magnifiques tasses avec des fleurs ! Each one is breathtakingly beautiful! Beautiful teacups! Hard to pick a favorite, but I do really like #1. thanks for sharing. 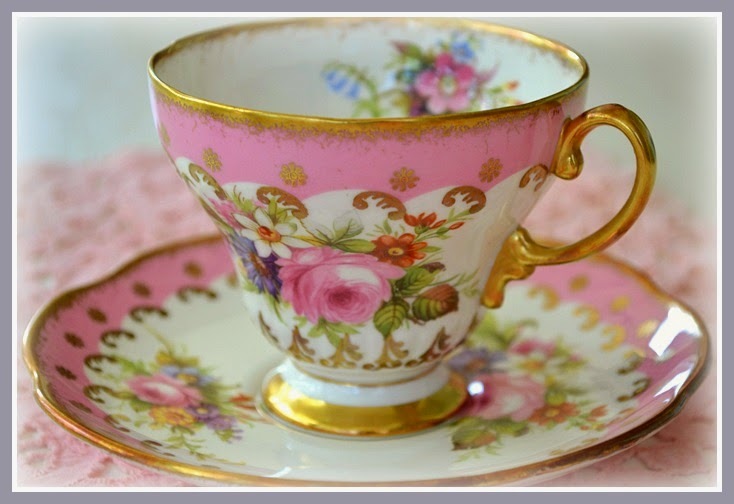 Your beautiful teacups make me want to switch from coffee to tea!! Beautiful !! Hi Terri! Now, I was surprised with you most romantic pick. You had me guessing pink and roses all the way. It is an interesting cup, to be sure - and I love you ruminating about the stories behind them - and their original owners. There's a novel in that to be sure. Terri these are some very romantic teacups! So pretty! Your photos are dreamy! Have a Happy Valentine's Day! Oh, my word your pictures are incredible, Terri! WOW! So beautiful!! all so beautiful, but the last is my favorite too! The color of course, and the big cabbage type roses are perfect! Big hugs my friend! They are all romantic to me Terri. Such a lovely collection! Wow, what an exquisite collection of tea cups and imagery...beautiful tribute to love..these are all definately romantic and magical! 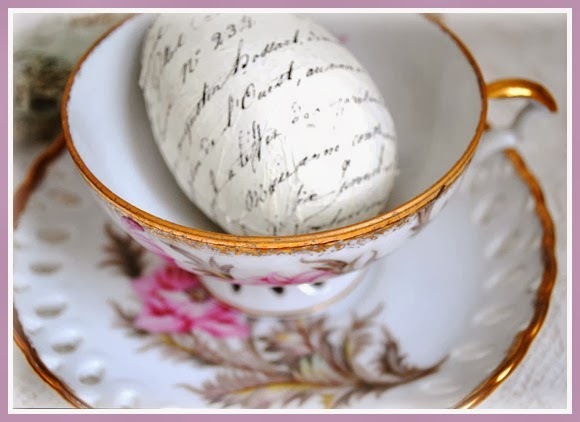 Loved the egg with writing on it in the cup...Beautiful..
That last tea cup is romantic. Very Gilded Age. I can image the Countess Ellen Olenska sipping from this cup. Happy Valentines Day Terri! I hope you have some chocolates coming your way. Nothing is better than tea in a gorgeous cup and chocolates. Thanks for sharing the cute cups. I am swooning here - soooo many beautiful teacups and tablescapes! that was a funny quiz about wonderful tea cups. I couldn't guess all, but the Meander and the Royal Albert. Your loveliest tea cup is really sweet. I think you are right, it looks like a very old one. Beautifully made and kept over long time. A real treasure. Thank you for sharing and hosting this wonderful tea time. 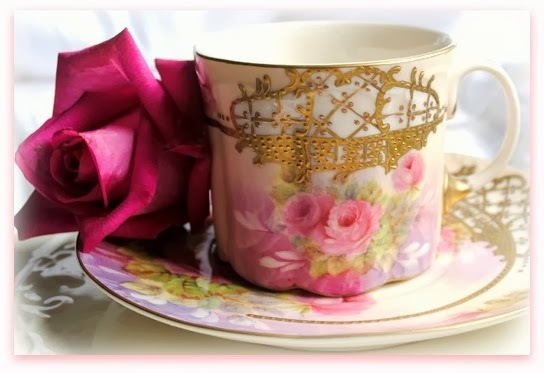 SO romantic, lovely cups! Happy Valentine's Day! They are all gorgeous and beautifully romantic - my favourite is the simplicity of the second one. So fresh and pretty. Every teacup is lovely, but #2 is my favorite. They are all so pretty and just lovely Terri. I can't pick either. Thanks for sharing your lovelies. These cups are so lovely. .. adorables! I had the most wonderful valentines day this year. And you?